Are you searching for the safest lightbulbs to purchase for your home or office? Well, there is a surprising amount of information that goes into that hunt. In this guide we’ll talk about the most common types of light bulbs, why some are more dangerous than others, what people are trending toward, and what I think you should buy. What is the safest light bulb? The safest type of light bulbs for overall health are simple incandescent bulbs. Although they are less efficient than their counterparts the LED and CFL light bulbs, they emit far less blue light and produce less dirty electricity. However, there is far more to this story, so I’d encourage you to stick around and learn everything there is to know about the safest light bulbs. If you’re new to EMF Academy, I’d encourage you to take a second and check out the Knowledge section where you’ll find hundreds of article on EMF radiation and wellness. Let’s start off by talking about some lightbulb basics. A while back, everyone used what are called Incandescent light bulbs, which are very similar to the first bulbs invented by Edison in 1878. They are simple, but also not very energy efficient. When the United States government and governments around the world began looking for more energy effecient alternetives, they did not take the time that they should have to assess the health impact of newer lighting alternatives. Many newer lightbulbs like the ones we’ll talk about down below actually emit a fairly high amount of EMF radiation. Not only from the bulbs themselves, but from the dirty electricity they create in your wiring. Don’t worry though, we’ll talk about this in detail. Let’s first get a basic overview of the some of the most common types of light bulbs on the market today. 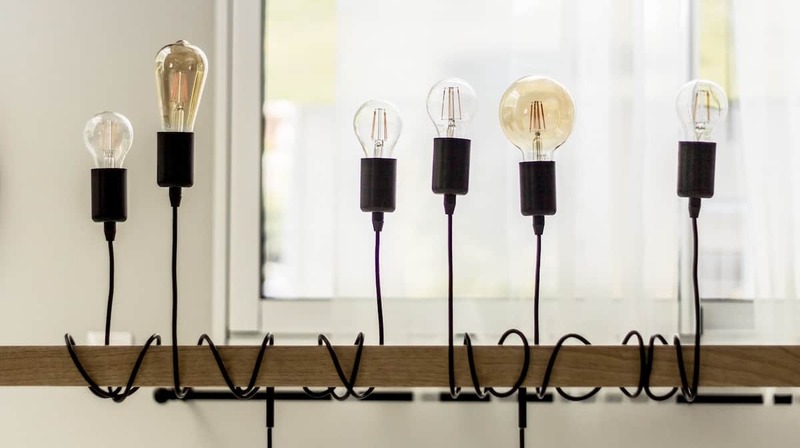 The first thing we have to talk about is incandescent light bulbs, which are the ones you are probably most familiar with, and probably grew up with. These are the simple, standard light bulbs you would put in all the lamps of your home back in the day. Electricity from you 50 or 60 hz wiring passes through the coil you see inside the glass, which heats a filament until it is extremely hot. Inside the bulb is a simple gas that helps to prevent the super hot metal from combining with any oxygen (which is why it has to be contained in a bulb) because the oxygen would cause it to burn out. So, they are a fairly simple design, which is why they were used almost exclusively for 150 years. However, the problem with these bulbs is that nearly all the energy coming from the wiring was actually going to produce heat (heating the filament) instead of to produce light. This process is not energy efficient. However, since the wiring in most homes was installed when incandescent light bulbs were pretty much all that was available, they were designed to do just that. As you’ll discover down below, newer, more energy efficient bulbs must alter the electricity in our homes, producing dirty electricity, and ultimately EMF radiation. Another important distinction between older style incandescent bulbs and newer fluorescent bulbs like LED and CFL is the spectrum of light emitted. You’ll probably recall that these older style bulbs emitted a much oranger/yellower light. This light contained much less blue light than newer bulbs, which itself has impacts on our health (we’ll talk about this in a minute). Alright, now let’s talk about the increasingly popular LED bulbs. LED or Light-Emitting Diode bulbs rely on (you guessed it) a diode to produce light. The diode controls the direction of the energy flow. They are illuminated soley by the movement of electrons within a semiconductor material. They last far longer than incandescent bulbs, can be much brighter, run cooler, and use far less electricity. For all these reasons and more, LEDs are everywhere. From the screen on your smartphone to the monitor at your work to the television in your home, even many of the bulbs around you all are LED. Are LED Light Bulbs Safe? Creation of Dirty Electricity and increased EMF Radiation exposure. Let’s first talk a little bit about the first one. LED lights are a type of fluorescent light, that contain a blue light, a driver, and a fluorescent sheet that covers the blue light by extending the wavelengths producing a more yellowish or orange light. This can fool your brain into thinking it is a more natural light, but does not protect your from the dangers of blue light exposure, especially at night. If you’ve read any of my other articles on blue light, you probably already know that you want to avoid it especially in the few hours before bed. The primary reason for this is that blue light from sources like your phone, laptop, and LED bulbs suppress melatonin production, the hormone responsible for regulating quality sleep and wakefulness. Blue light also dramatically reduces the restorative capabilities of your eyes. On top of that, to maintain optimal health we need to be balancing any blue light we receive with red parts of the spectrum from things like sunlight. So, not only does blue light affect the quality of your sleep, but can also reduce your overall quality of health. Alright, now let’s talk a little bit about dirty electricity. I’m not going to go into too much detail here, because I’ve already written several articles on this topic, however I think it’s an important concept to grasp if you want to find the safest light bulb for your home or office. Essentially, most home wiring systems are either 50 or 60 Hz depending on if you live in the United States or Europe. This worked great when most electronics and light bulbs only needed a simple flow of electricity. However, as new technologies have been developed, they have required more, less, or different types of electricity. When the electrical system in your home is messed with in this way, unusable electricity gets trapped in the wiring of your home, and this is called dirty electricity. Dirty electricity produces a measurable amount of EMF radiation in your home. There are ways you can filter out this dirty electricity (see this article here) however one of the best things you can do is limit the devices that produce it. Alright, now that we’ve talked about how LED bulbs work, and why they aren’t the safest option, it’s time to talk about the worst of the light bulbs – the CFL. Alright, now it’s time to talk about what in my opinion is probably the least safe light bulb on the market today, the CFL. CFL bulbs (or Compact Fluorescent Light bulbs) use an electric current driven through a tube typically containing mercury vapor. Many people still purchase CFL bulbs because they use less energy than incandescent bulbs, and are less expensive than most LED’s. So, although you will still see CFL’s around now and then, you should really avoid them, let’s spend a few minutes talking about why. I would say that they are, and there are a few reasons why. First of all, we need to talk about the impact the UV light has on our bodies. When the mercury inside the bulb is electrified, it emits UV radiation. An increased absorption of such UV radiation from CFL’s has been linked to a variety of health effects and skin disorders. In fact one study specifically linked UV light from CFL’s to various issues with the skin and cells. The energy efficient compact fluorescent lights that are commercially available generate radio frequency radiation and ultraviolet radiation, they contain mercury—a known neurotoxin, and they are making some people ill. Instead of promoting these light bulbs governments around the world should be insisting that manufacturers produce light bulbs that are electromagnetically clean and contain no toxic chemicals. Possibly of even greater concern is for those individuals who suffer from electro-hypersensitivity. EHS as it’s more commonly called causes sufferers to exhibit physical symptoms when exposed to high levels of EMF radiation such as headaches, nausea, dizziness and more. The final issue with CFLs is an issue shared with LEDs, dirty electricity. Just like LED bulbs, our wiring systems were not built to handle the demand of CFL’s which leads to dirty electricity. This dirty electricity builds up in the wiring of our home flooding it with EMF radiation. Selecting the safest light bulb can be a little bit tough, especially if you are trying to keep energy efficiency in mind. Although they are certainly not the most energy efficient, many experts agree that the safest available lightbulb are old fashioned incandescent. However, I want to just hand out a few a few select tips related to light bulb safety. If you have to use CFL bulbs (let’s say they are all that is being installed at your workplace) try to choose the ones that are double encapsulated. This will help to protect the mercury from leaking out of they are dropped and are generally a safer option. If you do happen to drop a CFL, check out this guide from the EPA on how to safely clean it up. If you have to use LED bulbs instead of incandescent try to use the ones that do not have a transformer. Also, if incandescent isn’t an option, always select LED over CFL as it is certainly safer. Stock up on Incandescent bulbs. As more regulations about energy efficiency come out, these older style bulbs are going to be produced less and less. With less production comes higher prices. If possible, try to stock up on these while you still can. Sunlight is the best kind of light! No kind of light is better for our health than natural light. Now, that’s not to say that we shouldn’t still protect ourselves from the sun (as this can be damaging to our skin) but there are enormous health benefits (including Vitamin D!) that come from natural light. This will also help your body maintain it’s internal clock better. Picking the safest anything these days can actually be pretty hard. With technology moving so fast, and so many health issues to consider, it can be tough to make the right decisions. Although it isn’t always the case, it often happens that older technologies can be safer in general. This is certainly the case with incandescent light bulbs.